The Arab-release video is more graphic, showing the full imperial snuff job. The American corporate state censors -- the masters of imperial war propaganda -- might have helped construct an Orwellian and therefore officially amnesiac society but they are not entirely ignorant of history. They don’t want to repeat the notorious imagery of 1968, when American television viewers watched a “Viet Cong” resistance fighter fall to the ground with blood spurting out of his head after being crudely executed by a “free world” South Vietnamese officer. The action we see is certainly consistent with the training and rhetoric handed down from the higher-level military authorities, from the much bigger war criminals, who speak of the Fallujah “enemy” as “Satan” (never forget that this is a “new crusade,” as Rahul Mahajan says). The bigger mafiosi tell the smaller US military personnel that they are avenging 9/11 in Iraq (despite fact that Iraqis and 9/11/al Qaeda had nothing to do with one another). The big dons certainly encourage the GIs to kill as many “sandniggers” and “ragheads” as they can. Anti-Arab racism is critical to this ongoing imperial savagery, making it possible for the White House and the military authorities to easily blend Osama and Saddam, al-Qaeda and Iraq, 9/11 and Baghdad in the first place and providing the essential moral lubricant of dehumanization that makes it possible for supposed moral agents of “freedom” and “democracy” to kill more than 100,000 of their fellow human beings in a distant land. These damaged men and women, these hit men of American empire, will return home as dangers to themselves and others, bearing evil inner demons that will carry a considerable cost in the imperial “homeland” (lovely word that). Watch the American release video (the only one I’ve seen, on PBS at 6 PM and a few minutes ago on ABC’s “Nightline”) and the thing that stands out is how nonchalant and routine the killing is. It all looks and sounds quite normal for the perpetrator and his colleagues. My strong suspicion is that such a blatant US violation of the Geneva Conventions is commonplace in Fallujah and in other parts of Iraq where open season has been declared on dirty Arabs. Since this one was caught on tape we will repeat the post-tragedy farce and false resolutions of My Lai and Abu Ghraib: there will be trials that seek to pin all the blame on the individual soldier, whose senseless amoral and racist criminality has been instilled from above and without. His crime is just a drop in the ocean of imperial criminality. He is a much smaller perpetrator than the truly evil ones in the White House and the Pentagon. Interesting to see the timing of this high-profile war crime with the resignation of Colin Powell, who broke into the public record by helping cover up the My Lai massacre and the significant extent to that epic war crime was the tip of the American atrocity iceberg in Southeast Asia. Other and broader war crimes for which no trials or investigations are planned: bombing civilians in Fallujah; mortaring civilians in Fallujah; shooting civilians in Fallujah; attacking ambulances and otherwise impeding medical services; sending back male civilians who tried to leave Fallujah before the American assault; denying the Red Crescent Society access to Fallujah; dropping 500-pound bombs on slums; raining cluster bombs on city streets; bombing clinics; attacking a hospital. 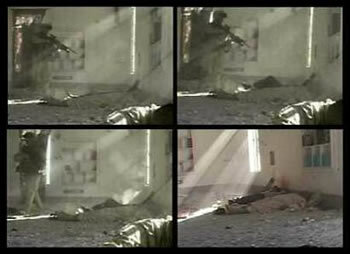 “Our” snipers are boasting of how they kill anyone they get in their sites. 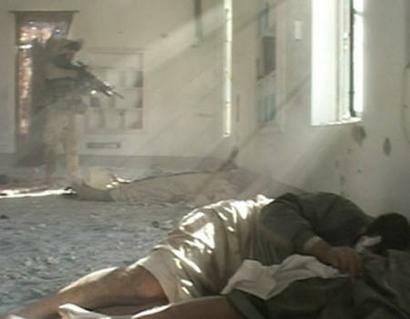 A Fallujah man recently watched his 9-year-old slowly die from a U.S. shrapnel wound. He couldn’t safely take his boy to a hospital under the glorious conditions of liberation delivered by American F-16s, A-10 Jets, and Bradley Fighting Vehicles. It’s not for nothing that Bush recoils in horror at the notion of “benevolent,” exceptional, God-Blessed America being subjected to -- imagine -- the jurisdiction of the International Criminal Court. Truth is, the whole invasion -- kind of hard to call it a “war” given the astonishing disparity in the combatants’ military power -- has been a monumental war crime from the beginning. International law forbids resort to war for any purpose other than defense of one’s own territory against imminent attack. But of course war crimes are never committed by the winners. What did Rush Limbaugh and Sean Hannity (? sorry I don’t know how to spell that popular radio fascist’s name) and the rest of the in-power far-right noise machine have to say about it all? What do you think they said...that the noble young warriors of freedom and democracy have a very difficult job and are doing their very best and probably didn’t actually do anything wrong. That the killing is being overplayed by those evil freedom-hating anti-American propagandists over at Al-Jazeera and that the brutal terrorist killing of M. Hassan is the real story, not the deaths of tens of thousands of Iraqis. Of course that’s what they say...they are fascists or something damn near. and some veteran member (did not get her name) of the National Security Council, who wished to defend Powell’s supposed noble record as a voice of multilateralist decency. Some spectrum, PBS. Sorry, I saw the film...it was all rather routine. The “bad guys” were bleeding and motionless on the ground (apparently, though, the resistance is now “booby-trapping dead bodies"). The second expert was a former soldier turned lawyer (Eugene Fidel), who finds the tape “problematic” and said that the troops are being placed in “truly insane circumstances” that are like “the battle of Stalingrad” (meaning fierce block by block urban combat and the like). Ok, the circumstances are surely insane, but Stalingrad? The third expert was Middle East area specialist Juan Cole of the University of Michigan, who seemed less impressed by the shooting than about the broader US public relations stupidity (and war criminality Dr. Cole?) of turning the Red Crescent Society away from Fallujah and about the plight of everyday ordinary civilians trapped without food and water in the besieged town. Middle East that is at issue, since other regions such as Europe, Japan, and China would be vulnerable to any power that has military, economic, and political ascendance over the Middle East and its oil” ("Notes From the Editors,” Monthly Review, November 2004, p.65).